Additional Features and Amenities Come and live the great life in a community like no other! 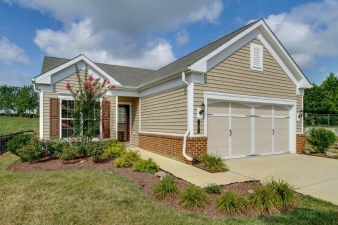 This Jefferson Model, 2 bedroom, 2 bathroom is located on a unique lot that sits higher up and has a beautiful retaining wall that lends character to this home. This beauty has wonderful curb appeal from the well-maintained landscaping to the handsome brick and vinyl exterior. As you step inside, the open concept living area is sure to please. Wall-to-wall carpet in the family room leads to the dining room with hardwood floors. The family room is quite sizeable and will fit a variety of furniture layouts. The many windows in this space make it feel so light, bright, and airy! Enjoy the convenience of extra space in the sun room which is attached to the family room and also has access to the backyard and patio. You will love relaxing after a long day on the stamped concrete patio, enjoying the view that this home provides, including the beautiful retaining wall.